All too rarely do we get the chance to quiz artists about their motives behind making recordings for commercial release. That’s a pity, for not only do many artists think long and deeply about what they want to record and why they want to record it, but as the people who buy and listen to these recordings, we find these insights deeply helpful to our understanding of the performances we experience. 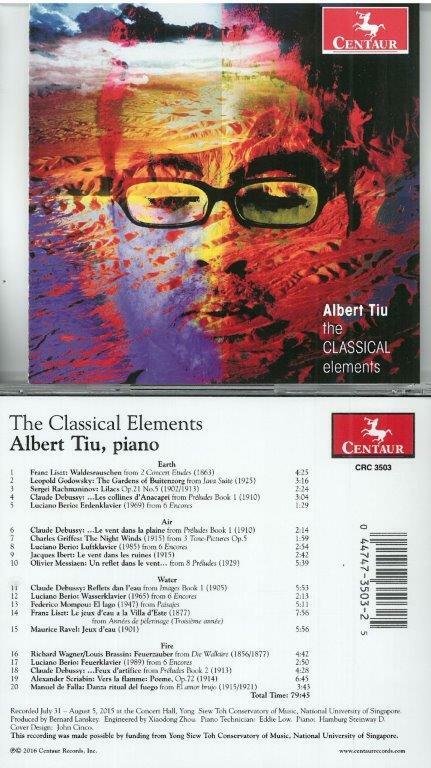 As it happened, I attended a discussion last month on the place of recording in today’s musical world, and as Albert Tiu was on the panel, someone in the audience was able to ask him directly, why he had chosen to record this album of diverse piano pieces, most of which are already well represented in the catalogues. Tiu is an artist who does think deeply about what he records and why, and he gave a detailed explanation of the thinking behind this programme, why he had devised it as four thematic sections – Earth, Air, Water and Fire – and why he had chosen the specific pieces to go into each thematic group. It was a fascinating insight into how an artist devises a programme, but it also revealed how an interpretation of an old favourite is often adjusted to suit a new context without any loss of integrity. It is intriguing how, for example, the journey from Debussy to Berio, or from Berio to Mompou, is far less awkward than we might at first think. Berio’s reflective Wasserklavier merges almost imperceptibly into Mompou’s El Iago which, in turn, moves fluidly into the world of Liszt and his Le jeux d’eau a la Villa d’Este. This is an intelligently devised programme, with thematic cohesion, but it is also an intelligently played programme with interpretative insight which is very strongly flavoured by the external elements of the programme. I first heard much of this programme live when Tiu played it in 2012 at an exhibition of French Impressionist paintings held at the National Museum of Singapore, and on that occasion one was struck by the musical relationship with the visual images. Those visual images are absent here, and somehow the music takes on an even more potent quality, not so much summoning up visual images as creating whole worlds of imagery which go far beyond the concept of Impressionism and into the realms of psychological perception. I am a little surprised by Tiu’s very masculine, assertive reading of Debussy’s Le vent dans la plaine – not, for him, the airy, elusive quality of Debussy the so-called Impressionist, but more a composer who sees the wind as something which does not merely pass by, but creates very distinct, almost destructive, physical effects on the landscape it passes across. And this kind of strong, assertive performance means that the move into the rather more hard-nosed harmonic environment of Charles Griffes’ The Night Winds is fluently achieved, and serves to enhance the underlying message that the wind is something every bit as physical as it is atmospheric. Taken individually, each performance is technically assured and interpretatively perceptive, but taken as a whole, this programme is elevated by what some might see as the external concept of the Four Elements. It is for this reason - that even established pieces can be viewed in a totally different light according to the context in which we hear them - that we do have so many recordings of the same music. And thank goodness for that. Albert Tiu’s intelligent and artistically-driven performances certainly shed new light on this music, and also give us performances which stand comparison with the very best in any context.